It is the motion picture equivalent to the Academy Award for the cinema, Premio Regia Televisiva for television, the Premio Ubu for stage performances, and the Sanremo Music Festival for music. 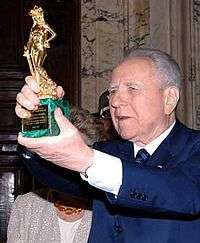 Following the same criteria of the Oscars, the David di Donatello Awards (known by the moniker "Donatellos") were established in 1955 and first awarded in Rome on July 5, 1956. Created by a cultural club (then called The Open Gate), the aim was to honour the best of each year’s Italian and foreign films. In 2015, it was announced that both the eligibility period and the award ceremony date would change in the coming years. In 2016, the ceremony was brought forward to April. For the 2017 ceremony, the eligibility period will be March-December 2016. For the 2018 edition, the eligibility period will be the 2017 solar year (January to December). ↑ "Oscar's Foreign Cousins". Variety. Variety Media. December 9, 1998. Retrieved March 26, 2016. ↑ Laviosa, Flavia (January 29, 2015). "David di Donatello 1956–2016: Sixty Years of Awards" [Call for Papers] (PDF). Journal of Italian Cinema and Media Studies. Intellect. Retrieved March 25, 2016. ↑ "David di Donatello, cambiano le date per il 2016 e il 2017 - LoudVision". Retrieved 26 October 2016. ↑ "David di Donatello: cambiano le date". Retrieved 26 October 2016. ↑ "Gold and malachite 'David'". Sotheby's.